Enjoy the marine life of the Western Cape coastline as you sail across the water at Gansbaai. With endless sealife to spot, this tour is one of the best things to do on a Cape holiday. Travel along the coastal road to Hermanus, enjoy some whale watching and visit the penguins at Stony Point. Seeing a whale up-close is one of the most amazing sights on Earth. 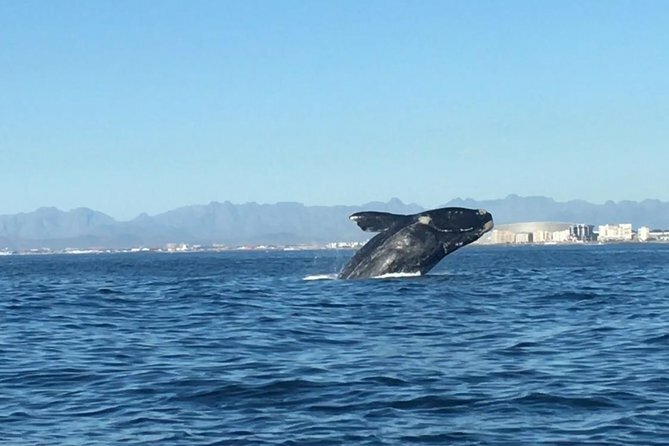 If you’re looking to experience the marine life of the Western Cape coast, choose whale watching in Gansbaai. Hop aboard a boat and sail along the stunning cliffs of De Kelders, as you keep your eye on the waves. This amazing tour offers visitors to the tiny fishing harbour an unforgettable experience. The boat trip takes you through Walkerbay Nature Reserve, a semi-aquatic conservancy with the highest concentration of whales in South Africa. 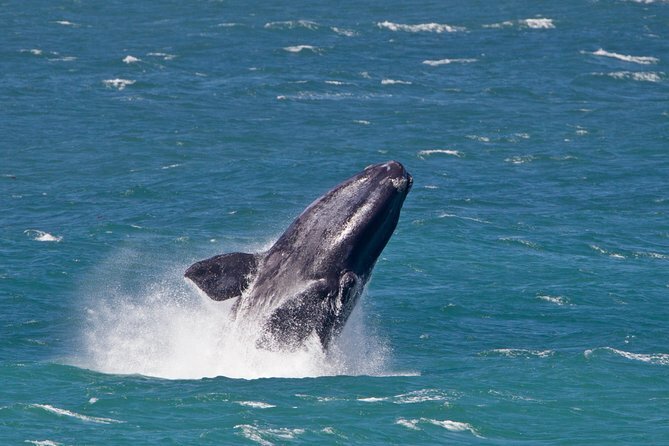 Look out for Southern Right Whales, as well as humpback, mink and Bryde’s whales. 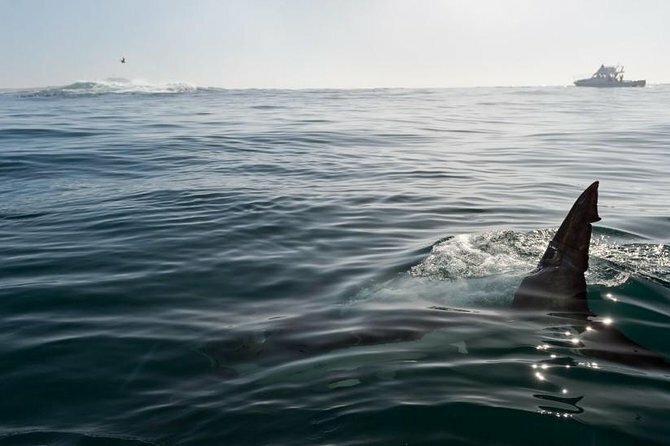 You can see an array of Cape marine life including majestic orcas, False Killer Whales, dolphins, sharks, Cape fur seals and tiny African penguins. 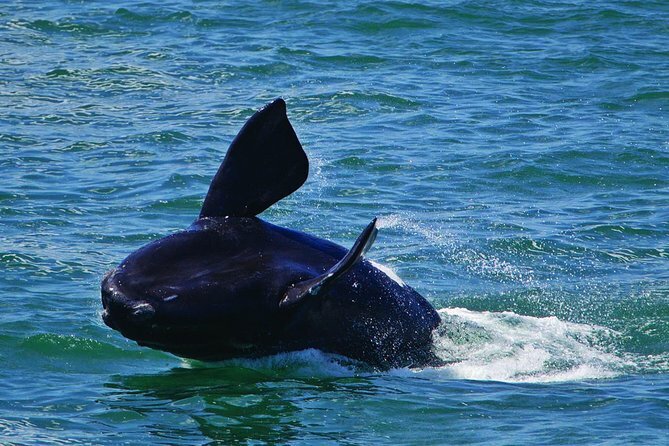 The Southern Right Whale is the star of the tour, as they are famously rare. The gargantuan creatures are playful in nature and provide an amazing addition to the Cape Whale Coast family. These fascinating creatures live to a very old age and have distinctive markings, including unique patches of callosites (that look similar to barnacles), which function like fingerprints. Boats can travel as close as 50m to the whales, but the animals’ safety and comfort is the number one priority. Southern Right Whales are easy to spot as well, as they release a distinctive v-shaped spout of mist, which can be seen from quite far away. Feel the sea spray on your face as you watch whales in their natural playground. For the best show in Gansbaai, head out on the whale watching tour of a lifetime. A great day, even if the whales to far to see them clearly We had great guide/driver who knew a lot and has a great sense of humor. The day was beautiful as well as the surroundings. Only downside was, that there was little time to enjoy the view when stopping & getting out to see the view (for pictures). Quickly taking pics and getting back in the bus seemed to be the goal. This instead of enjoying the great surroundings. But all in all, a great day! Excellent Nice and helpful people, good explanations!!! Fantastic day. Weather was a dream. We have seen wales on the walk. On the way to Hermanus we drove through a permanently changing countryside. Very entertaining to look out of the window. In Hermanus we walked along the coast with a beautiful view on the wales. Our guide was very nice. On the way back we visited the pinguins and he drove along the seaside back to Capetown Telinho us a lot about locals. Ultimate experience, competent guided, lots of whales and dolphins. Can highly recommend that tour to nature lovers. A full day tour that brought us to many scenic places along the coast, with a 2hour boat ride out to catch the whales basking in the sun, followed by a yummy lunch in a quaint village. A perfect day! I booked the Full day whale watching in Hermanus trip from Cape Town. Not up to the usual Viator standards, by far. The tour as advertised in the UK is not what we got. We were not taken to the cliff top walk we were given restricted time in the town, which had to include lunch we did visit / tour an industrial estate we were taken to a hill top overlooking the town, but miles from the coastal pass. To see the whales, we had to take the boat trip, which was expensive, and many Japanese tourists found it much too rough. There was no time to visit the penguins, or the Nature Reserve, or the botanical Gardens but time was made to visit a winery. Conclusions – The whales were an exciting experience, but I would not recommend this particular trip to anyone. Not enough time for the lunch in Hermanus! The trip was very beautiful, passing through amazing landscapes. The guide Rodney was knowledgeable, though not a very good listener. Nevertheless, he made sure we got the best spots for each activity. We saw Whales and Penguins. Wine tasting was also done, though in short. It was disappointing. We didnt feel the guide wanted to make a nice trip like I felt with other guides in South Africa. We spent only 10min in Hermanus, they guide wanted to do only a drive through!! and the town was nice enough to have been there more time. The boat was too expensive for its real duration and we were not informed about it, we felt the guide was more interested on her commission instead of informing properly the boat was 700ZAR, around 50, it was almost 2 hours but more than 1h was spent going to the whales, and after the boat we lost 1h in the harbor that could have been spent in Hermanus. Also, we didnt do the wine tasting, she said it was closed! We were given a bottle of wine, we didnt want a free bottle of wine, we wanted the experience of knowing more about South African wines! Hermanus is a nice place, the tour was not a nice experience. A fantastic trip, a great driver/guide who was informative and amusing. Wonderful scenery, I managed to go out on a boat and had super views of the whales. Probably one of the best day trips I’ve done. Great day out and great guide. We skipped the whale boat trip but the view from the cliffs was amazing and the guide kindly lent us his binoculars. Tour was over all great, only irritant was that the boat was mega crowded and it made it hard to get a good viewing spot. we had perfect weather and the guide found several places to veiw whales, with a calf learning to flip its tail too.beautiful place to visit and stay,. Tour along the southernmost coast of (south) Africa. Watching pinguins and whales and lovely little towns.